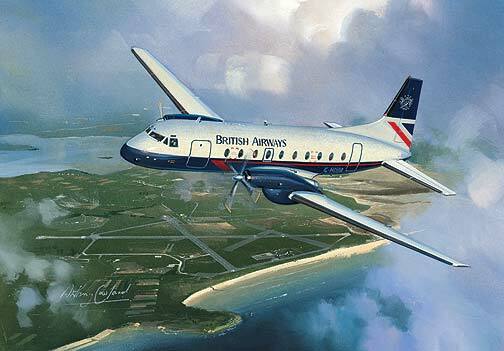 Out through the rough and bumpy air a British Airways Hawker Siddeley HS 748 climbs away from Stornoway on its daily service through the Highlands and Islands network. Nicknamed the Budgie by its crews this tough aircraft flew in an unforgiving environment keeping small outlying communities in the region in touch. Released as a limited edition print of 250 by the artist Anthony Cowland G.Av.A.